¶ Twelfth night refers to the last day of the Christmas holiday season, a time for playing practical jokes, such as hiding birds in pies, and going to plays. 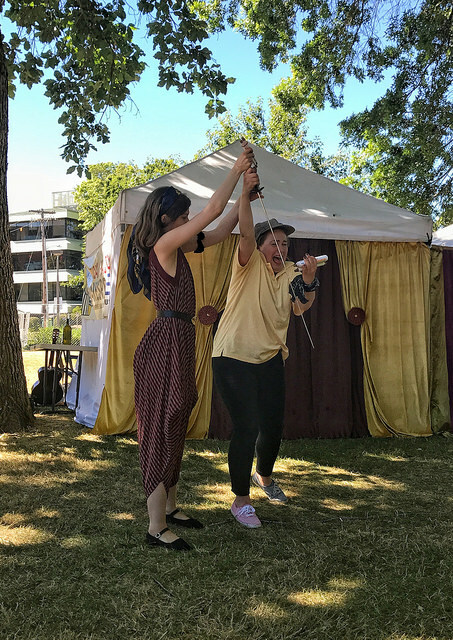 Like most of the plays being done as part of the Original Practice Shakespeare Festival’s WIL Fest this month, twelfth night only comes once a year. It is special, occasional. I was reminded of this context when listening to Beth Yocam’s pre-show pitch: “this is the first time this group of actors has done this play together.” While Performance Studies teaches us that, because of its liveness, no two performances are alike, for OPS Fest this is doubly so: there is no chance to rehearse before the show or get another crack at it with this group of actors. What is more, this is true of every OPS Fest show. This is the only chance they get to play in this part with this group of people. If they do it again, the ensemble will be different in some—usually many—ways. For an OPS Fest actor, the stakes are high at every performance, so there is no room to phone it in or get bored. ¶ This occasional context also had me thinking about the other acts of courage that playing with OPS Fest requires…and not all kinds of actors are necessarily up for. If you’ve been to a show in the parks this year, you’ll notice that the actors play not only all the way up to the edge of the audience, but in the audience. 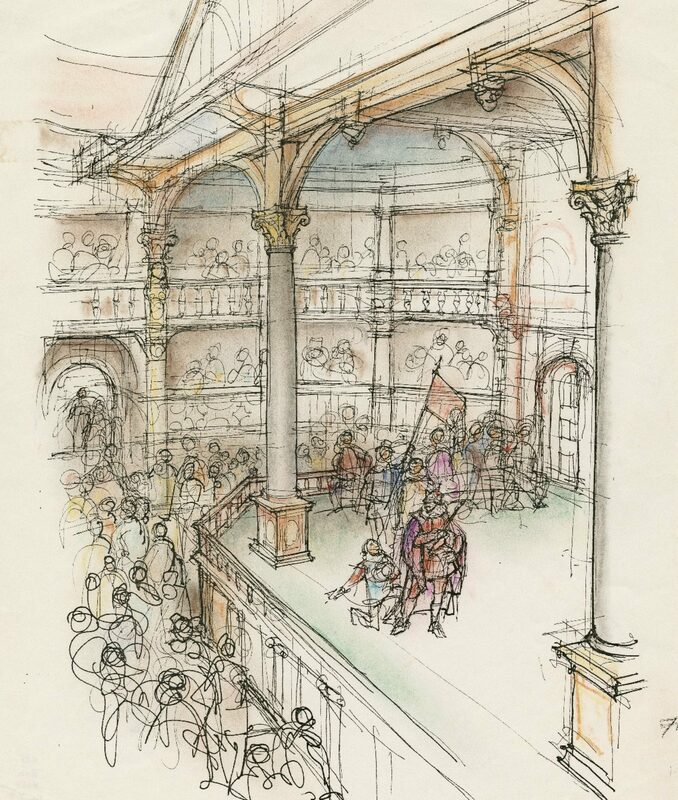 When the London Globe theatre opened, backers were nervous and assumed no one would pay for the standing “groundling” tickets. These are now the first things that sell-out, and recordings demonstrate people love to lean in on the lip of the stage. Audiences want nearness. 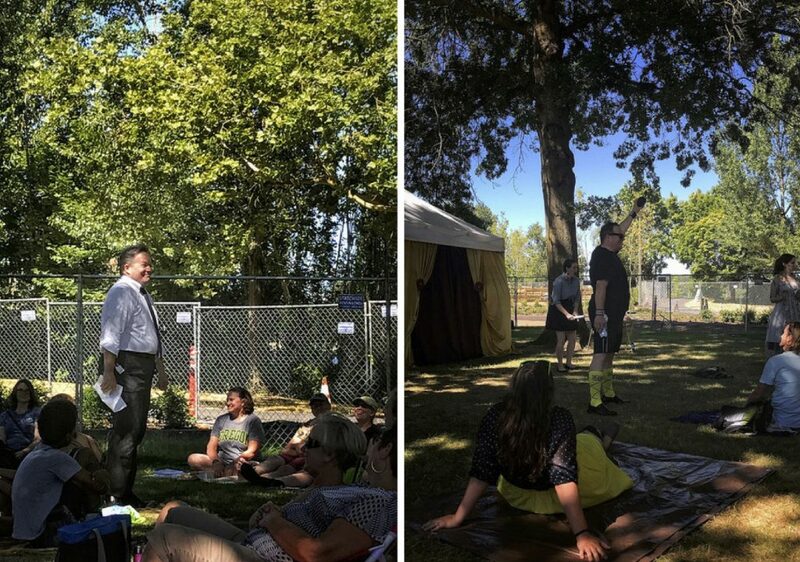 In the WIL Fest “Twelfe Night,” it felt like a third of the play was performed in and amongst the lawn chairs and blankets. Intimacy like this takes courage, a willingness to be close to an audience member you don’t know and not drop a line—let alone step on someone. This isn’t instinctual. The other kind of courage is that of trusting the other actors, often some of which you haven’t worked with before or in a long time. Will they say their lines correctly? This matters, as a well-timed entrance depends on a correctly delivered cue-line. With the three months of rehearsal that contemporary theatre companies use, it’d be silly if you hadn’t developed a rapport with your fellow players. There is also the added variable of apprentices being worked in to every show to consider. There is little way around giving yourself over to the process if you want to be protected by it. ¶ A play about disguised twins and forged letters, in what ways was this “Twelfe Night” affected by the dynamics of performer courage? From left: Emma Whiteside (Fabian) and Kaia Maarja Hillier (Viola/Casario). PROMPTER: Wait, wait, wait. Do you actually have the hiccups? AGUECHEEK: I literally just got the hiccups. PROMPTER: Would you explain to our audience how you got them? As Lewis turned her back on them to start talking to the audience, Joel crept up slowly behind her, quickly grabbed her shoulders, and scared her. Because the Prompter never leaves their chair, it was very unexpected and worked! Aguecheek moved over to Sir Toby Belch (Beth Yocam) to whimper at her friend. The Prompter replied, “Do you not feel safe anymore? I’m sorry, I’ll take care of you.” A mild non-verbal antagonism between the two continued for the rest of the performance, producing comic results. ¶ Durham recovered his credibility as Prompter when veteran Sarah Jane Fridlich (Olivia) had a faulty stretch in her scroll, which was missing the better part of a scene. For a moment she leaned over the prompter’s shoulder, and then had to resort to taking the promptbook with her to continue the scene. Whilst she did so, Durham would through her part, located her pick-up, and handed it off during a pause in the dialogue. As I discussed in a previous post, the Prompter has a dual role as part shepherd and part creative contributor—a co-writer even. A caveat to this dual role would seem that one cannot sacrifice the shepherd status for the merits of a comic payoff. The Prompter here was protecting the cohesion of the show by startling Lewis out of her hiccups, but interestingly still needed to regain their position of safety-net. Tom Witherspoon (Malvolio): the infamous smile and garters. ¶ The Prompter is not only as a safety-net for the actors, but also the audience. For example, Kerry Leek, in a pervious performance, made sure a stolen hats made it back to their owners. Today’s performance was set upon by an great number of cyclists using the nearby riding path on the edge of the audience space. At least thirty stopped to watch a scene featuring Viola/Cesario (Kaia Maarja Hillier), crowding the concessions and startling the group. The Prompter, a cyclist himself, again paused the action: “Woah, so many bikes! Cesario, would you, in a poem, invite them to join our show?” Hillier walked into the audience, opening her arms as she improvised a rough first stanza of a sestina that was part explanation of the performance and part invitation to sit and enjoy. A few did, and the audience was recovered from fully be broken from the safety of the performance. let those that play your clowns speak no more than is set down for them; for there be of them that will themselves laugh, to set on some quantity of barren spectators to laugh too, though in the meantime some necessary question of the play be then to be considered. That’s villainous, and shows a most pitiful ambition in the fool that uses it. He was replaced by Robert Armin, who specialized in delivering the lines he was given in compelling ways, as well as was featured for his lovely singing voice and verbal comedy. (Click here for a quick article on the evolution of fools.) When you see Andrew Bray and Noah Goldenberg in a fool’s role, you are seeing this Armin-style performance: adding polish with beautiful music and capitalizing on what the text has to offer, particularly in mimicry and puns. From left: Tom Witherspoon (Malvolio) and Noah Goldenberg (Clowne). ¶ When you see Lewis, Yocam, Shandi Muff, or Brian Burger in a clown role, it is a Kemp-style of clowning: using the text as fodder to develop gags and jokes. Watching today, I was wondering to what extent the moments the Prompter interjects or the actors choose to riff upon are the same moments Kemp or his predecessor Richard Tarlton would have capitalized upon, like Easter eggs laid to discover? Are they finding the same openings? Do those openings have similar features we could codify as an embedded cue? PROMPTER: Sir Toby, what is your favorite song Aguecheek plays on the viol de gamba? It added to the musical soundscape that opens the play: Feste (Goldenberg) with a singer opened the show playing to a morose Orsino (Burger). Yocam as Toby did a number of moves to encourage participation: (1) presented vulnerability, (2) identified a commonplace song so ubiquitous everyone would likely know it, and (3) feeling empowered to be in on special knowledge (the song), we were encourage to sing along. In so doing, spectators might feel like contributors to the performance. In other words, sometimes it is crucial to mess with the script in the moment. From left: Emma Whiteside (Fabian), Lissie Lewis (Sir Andrew Aguecheek), Beth Yocam (Sir Toby Belch), and Kaia Maarja Hillier (Viola). BELCH: What is thy excellence in a galliard, knight? AGUECHEEK: Faith, I can cut a caper. BELCH: And I can cut the mutton to’t. AGUECHEEK: And I think I have the back-trick simply as strong as any man in Illyria. ¶ This exchange references a series of different dance steps including a “galliard,” a live dance in triple time for two people. Sir Toby is asking if Aguecheek is up for dancing with others, to which she responds yes with “I can cut a caper,” or a playful skip. In this context, Lewis did so, struggling happily with her huge boot on, maximizing the body humor of the moment. Without such, the lines imply Aguecheek is shy, which is part of the reason he cannot get Olivia’s attentions. With the restraint of the boot, Lewis was free to develop an Aguecheek with a healthy ego and sense of unwarranted bravado, and whose limitations could all be directed back to the foot. With the affirmation of her “caper, ” Toby responds that she will be the other dancer and “cut the mutton” to Aguecheek’s jig. 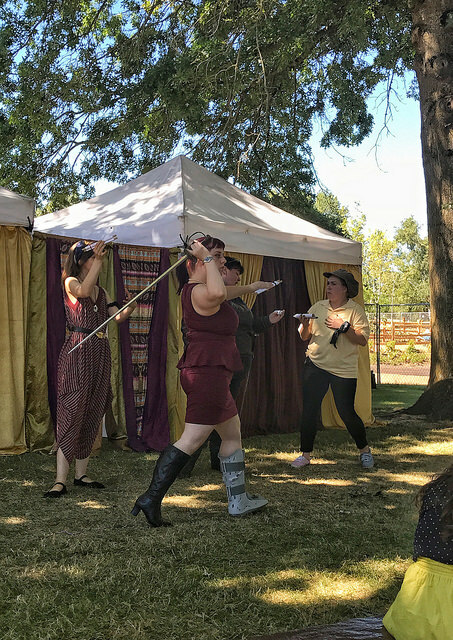 Whether it is following the letter of the joke, taking liberties with a set-up in the play, or using something in the environment to find a new comic inroad for a very old scene, OPS Fest demonstrates the range of clowning and tricks in the spirit of a twelfth night—a Christmas in July. 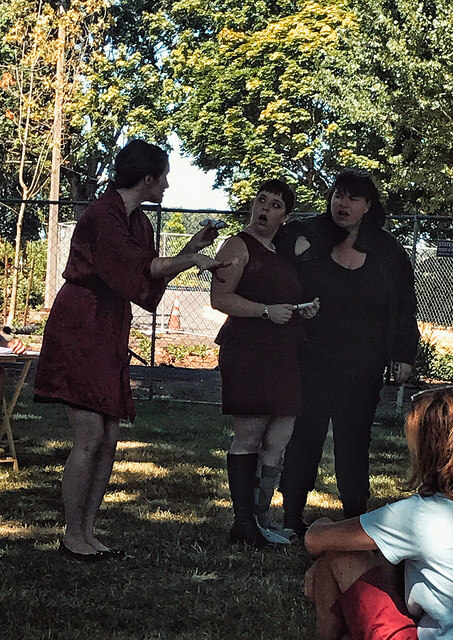 From left: Emilie Landmann (Maria), Lissie Lewis (Sir Andrew Aguecheek), and Beth Yocam (Sir Toby Belch). ¶ Interested in chatting about anything you read here on the blog or about the shows you are seeing at WIL Fest? Do feel free to come find me and chat! I’ll be in a blue OPS Fest t-shirt, red lawn shirt, taking copious notes! You can also follow along with the hashtags #OnlyAtOPS on Twitter and Instagram. 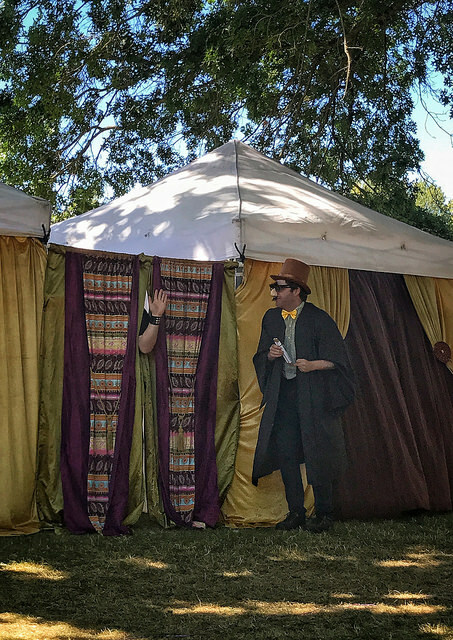 The WIL Festival, presented by the Original Practice Shakespeare Festival, runs 21 July to 6 August 2017. These will be rotation between the Portland parks of Willamette, Irving, and Laurelhurst, so check the online calendar for details. Free and open to the public, a green bucket is passed around after the show for donations. Want to donate online? Contribute to the Indiegogo campaign going on right now, and get some cool swag, too! Note that this is an outdoor performance, so do bring a lawn chair, beach chair, blanket, or other seating option. There is usually ample free parking in the parks themselves, as well as on the street in the nearby neighborhoods. Do watch-out for boats near the river launches.